This story originally debuted February 2001. Since that time, much new information has been discovered and added. This story has been updated and debuts here April 2003 after Mr.Morton attempted to sue ufowatchdog.com for libel, claiming this article and all information appearing on this website about him was untrue. Mr.Morton's lawsuit was dismissed as he was unable to provide the court with any evidence of his claim. Mr. Morton was also ordered to pay ufowatchdog.com's attorney fees. While Mr. Morton may blame conspiracies at work against him, legal maneuvering, and a myriad of other excuses for his defeat in court, the simple fact is that Mr. Morton was given an open and fair opportunity under the law to prove his claims. Mr. Morton was only required by California law to prove a single false statement was made by ufowatchdog.com. Needless to say, Mr. Morton failed to meet that simple requirement. Sean David Morton has been directly invited numerous times to submit a response or rebuttal. Mr.Morton has failed to respond other than through his e-list, making references to this website as "UFOWATCHPIG" and stating this website is full of "lies, liable, slander, bad research and disinformation..."
With Sean David Morton making allegations that this website is full of "lies, liable, slander, bad research and disinformation...", he is then obligated to offer such evidence. When asked on Coast To Coast AM with George Noory about his lawsuit against this website, Mr. Morton actually went so far as to state that ufowatchdog.com was "attacking" Morton's wife, mother, and his family. Nothing could be farther from the truth, as you will read, and this is yet another baseless accusation conjured up by Mr. Morton in an obvious effort to cloud the issue at hand: Mr. Morton's public claims and his alleged background. Several direct invitations have been sent to Mr.Morton and he is once again welcome to send any comment or correction with proper documentation to ufowatchdog.com and his comments will be posted here. Contact information for ufowatchdog.com can be found by clicking here. Please contact this website should you have any information that may confirm or refute the claims made by Mr.Morton, or if you have any comments. Anyone even remotely familiar with UFOlogy may recognize the name Sean David Morton. Appearing on the UFO scene during the early 1990s, Morton has made appearances at UFO conferences, on television talk shows and on talk radio gaining notoriety when he began making appearances on Art Bell's Coast To Coast AM radio show. Morton came to the attention of ufowatchdog.com a number of years ago when he appeared at the UFO Expo West in Los Angeles. A number of people have questioned the credibility of Morton, but few have actually engaged in any in-depth look into his claims. UFO investigator, psychic, TV producer, Hollywood script writer, movie producer, author, prophet, initiated Tibetan monk, drama professional, government insider, channeler, Doctor of Theology, remote viewer, astrologer...Sean David Morton has done it all, or has he? ufowatchdog.com presents the findings of its investigation into the many claims made by Sean David Morton and invites comment from Mr.Morton himself and readers alike. Since early 2001, Mr.Morton has failed to respond to direct invitations for comment on this story. Many hours have been spent looking into Morton's background with much of the information coming from Morton himself. The first source used for this investigation was Morton's Delphi Associates website where he listed his personal biography. Interestingly enough, after following up on an anonymous tip regarding Morton's education, the biography at Morton's website was pulled down. The biography appearing on the Delphi Associates website was downloaded and preserved on 04-JAN-01 with information having been taken from that copy, (now removed from the site. Ed.). Supporting information was provided by a second biography for Morton and a page found at the UFOMIND. Morton's biography appearing at his website (now removed. Ed.) was also used as were other sources, which are all documented for this story. All claims are quoted exactly as they appear on all of Morton's biographies and any other material written or distributed regarding Morton. Here you will find Morton's own words listed as CLAIM and the results of ufowatchdog.com's findings listed as FACT. FAMILY HISTORY CLAIM: "Sean David Morton grew up in an aerospace family where his father, a Navy Aviator and Korean Conflict fighter ace who was also a member of the original astronaut program. Gerard Thomas Morton, Jr., became the public relations director for NASA during the glory years of the Gemini/Mercury/Friendship/Apollo programs, and later retired as Vice President of TRW. Sean still remains close to astronauts Gordon Cooper, David Scott, Gene Cernan and Harrison "Jack" Schmidtt, all childhood family friends." FACT: A check for combat aviators with 'fighter ace' status was undertaken. Interestingly enough, there is no one with the name Gerard Thomas Morton listed. There were only 40 pilots given this status during the Korean War, and no one with the name of Morton is listed .Morton's father did retire from TRW, an aerospace firm based out of Ohio. Shelly Peet, Director of Human Resources for TRW stated the following, "We do show record of a Gerard T. Morton, Jr. being employed at TRW from 1963 to 1986. I do not have information about his position or title. He was employed with our business unit in California." Further investigation revealed that Morton's father retired as Vice President of Customer Communications and that his father was employed from 23-AUGUST-1963 to 30-JUNE-1986 . 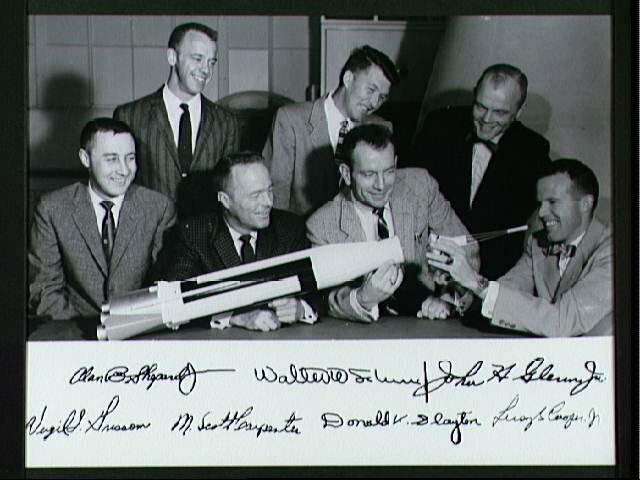 TRW has, for many years, had a business relationship with NASA, so it is possible that Morton's father may have had some interaction with some of its astronauts. NASA's History Office was also contacted regarding Morton's claim that his father was part of the original astronaut program. A representative for the NASA History Office stated, "We have no records of this person's name in our database of files in the Headquarters Historical Reference Collection." It would be logical to assume that NASA would have records of Morton's father considering the role he was alleged to have played at NASA during the golden age of American space flight. ABOVE: Photo from NASA archives (NASA image S62-02704) showing the original NASA astronauts. There is no mention of a Gerard Morton, Gerard T. Morton, Jr., G.T. Morton or anything closely resembling that name. If Morton's father was "a member of the original astronaut program" as is clearly claimed, then his name should be on record somewhere.